Dalchem offers a complete range of latex casting products. Latex casting compounds are natural compounds and are used by professionals from different fields such as theater and entertainment. Brushable latex is a modified latex for mould making. 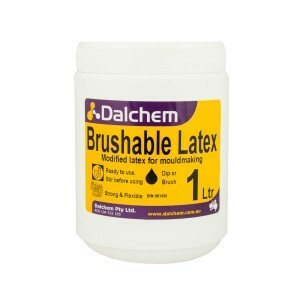 Brushable latex is very strong and flexible, and it is commonly used for concrete statuary and for making masks. It is available in pack sizes of 1ltr, 5ltr and 20ltr. Monster Maker Foam Latex Kit is available in two sizes (1Gal and Quart). The kit includes a high solids latex foam base, microcellular foaming agent, mould release, standard gelling agent, and standard curing agent.